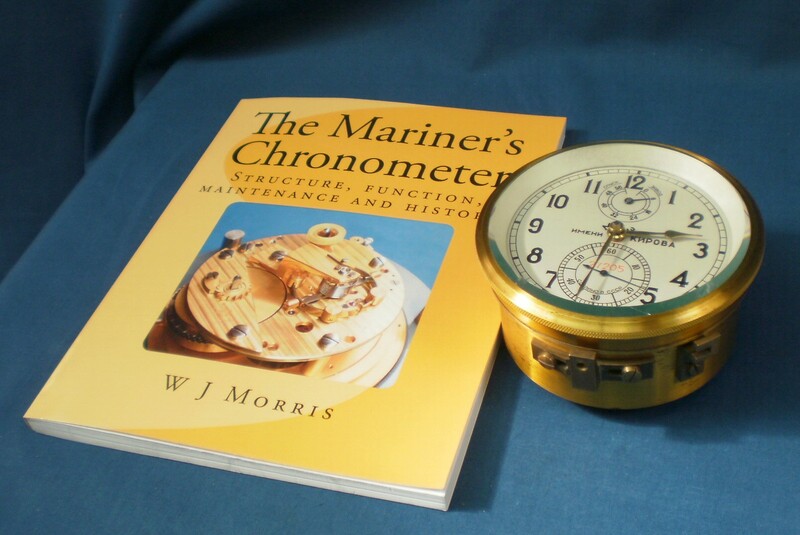 “The Mariner’s Chronometer” is a book about the marine chronometer like no other book, in or out of print. With many colour photographs and diagrams, it describes the structure and function of the machine, together with some of the science behind it. It then goes on to describe step by illustrated step how to dismantle, clean, oil and reassemble a typical modern chronometer. A timepiece that does not keep time is of little use, so regulating and rating is carefully described and this is followed by a chapter on care and transport of these lovely and, in part, delicate instruments. Most books in English on the chronometer are heavy on history and light on structure and function, and start with accounts based around people. The history section of “The Mariner’s Chronometer” looks at the instrument as the parts evolved into the modern machine and draws on French sources not easily accessible to the average reader. This is not a repair manual as there are many things that can go wrong with any timepiece and which require learning and experience to tackle, but I believe that many a person having a steady pair of hands and good eyesight is capable of overhauling a chronometer that is already in going condition. I know that at least one expert is aghast at the suggestion, but in truth the mechanism is essentially simple and robust. The escapement requires careful handling, but then so does the escapement of any pocket watch, which is built on a much smaller scale yet which is routinely successfully overhauled by the non-expert. There is an appendix about adjusting the escapement for the more adventurous amateur and even a professional might find it a useful summary and reminder. As it is a print-on-demand publication it is relatively easy for me to make additions and corrections, but I am reluctant to increase the length of the book, as I wish to keep the price reasonable. Please let me know of important errors or ommisions. Here is a link to buy the book. This blog site aims to support the book with occasional contributions about repairs and replacements. I am not willing to undertake repairs for others, but plan to share my experiences, sometimes painfully acquired, so that others may benefit. Comments, which I hope will be made kindly, are welcome. I recognise that experts are jealous of their skills. I invite them to share them in the form of guest blog posts, but I reserve the right to edit or refuse such posts. If you feel you might be interested, please Contact me to discuss what you may have in mind.